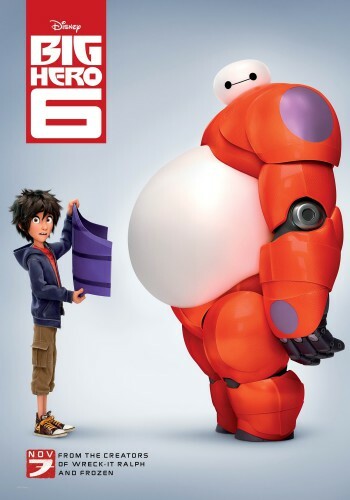 SYNOPSIS: A special bond develops between a plus-sized inflatable robot named Baymax and young prodigy Hiro Hamada, who team with a group of friends to form a band of high-tech heroes. REVIEW: Dear, Disney. Stop killing off all the parents. Yes, we know bad stuff happens in life. Yes, we know tragedies occur and people die. But can we just have one movie where both parents are alive and well and living happily with their kids? Is that too much to ask? I’m ok with creating dramatic tension in kids’ movies, but there are plenty of ways to do that without killing off the parents. Thanks … Jane. Unfortunately, we’ll have to wait til the next Disney movie to see how the parents fare, because they’re long gone before “Big Hero 6″ even starts. This animated adaptation of the Marvel comic of the same name is set in a fictional futuristic city that’s a compilation of San Francisco and Tokyo — San Fransokyo. That’s clever. The story follows 14-year-old genius Hiro Hamada (voiced by Ryan Potter), who would spend his time at robot fights than go to school. That is, until his older brother, Tadashi (Daniel Tenney), introduces him to the university robotics lab, where he and his friends invent super-cool things under the guidance of department chair Professor Callaghan (James Cromwell). Hiro decides he wants in and goes about inventing “microbots” that can be controlled telepathically through a headband-like device. Working together, the tiny ‘bots form into amazing shapes, and the invention is so impressive that Hiro is immediately accepted into the program. As Hiro and Tadashi head off to celebrate, a fire breaks out in the exhibit hall, killing Tadashi. Ok, at this point, one of the kids sitting in front of me asked his mom, “What happened to him, Mom? Is he coming back?” Rather than try to explain the existential nature of life and death in a kids’ movie, she took her two kids and left the theater, never to return. Dear, Disney. Don’t kill off any brothers either. So, Tadashi may be gone, but he left behind a project he was working on: an inflatable robot named Baymax (Scott Adsit). This cuddly, plus-sized “personal health companion” is designed to diagnose and heal people of their ailments. Thankfully for Hiro, that includes emotional ailments, because the kid is living under a cloud of doom. But, wait! Hiro discovers that his microbots weren’t destroyed in the fire, after all. Instead, they’re being controlled by a masked villain who looks a lot like Star Wars’ Darth Maul. Hiro gathers together Baymax and Tadashi’s best friends — Wasabi (Damon Wayans Jr.), Honey Lemon (Genesis Rodriguez), GoGo (Jamie Chung), and Fred (T.J. Miller) — to find the villain and uncover the mystery of the fire that took his brother’s life. Look, tragedies aside, there’s plenty to love about “Big Hero 6.” The adorably marshmallow-like Baymax is a great character, and the perfect antidote to Hiro’s emotional distress. And the heroic team is supportive and fantastically nerdy — feisty female GoGo; comic-loving Fred; gentle Wasabi; and perky Honey Lemon. I also love that these tech-oriented kids are celebrated — not told to turn off their computers and go outside and play (well, they do end up going outside to play, in a unique way). Yes, I think it’s good to balance out the screens with outdoor time, but screens — and science, technology and robots — can be good! And yes, even though there’s a tragic storyline, there’s also a sweet message about honoring your dearly departed, recognizing the importance of grief and healing, seeking justice rather than revenge, and putting yourself in harm’s way to help others. While “Big Hero 6″ doesn’t come close to my favorite kids’ superhero movie, “The Incredibles,” it’s still a good movie for kids 7 and older. Violence/Gore: Two brothers are orphans in the care of their Aunt Cass. A major character is killed in a fire. Remote controlled robots battle it out at robot fights, with some unsavory older characters participating. A masked villain sends microbots after Hiro and his friends. All the heroes have techie weapons, but no guns. Characters put themselves in harm’s way to help their friends. Baymax is reprogrammed to “destroy” rather than heal, and ends up hurting the heroes. Everything culminates in a big battle scene with lots of action and peril. Profanity: None. “Nerd” is used, but generally in a positive light. Drugs/Alcohol: Grownups drink at a reception. Baymax acts “drunk” when his battery loses charge. Which Kids Will Like It? Kids 7 and older who like animated comedies and aren’t traumatized by character deaths. Will Grownups Like It? “Big Hero 6″ features interesting characters and positive messages about technology and learning, but it’s too centered on grief and loss for very young kids. Images in this review used courtesy of Walt Disney Studios Motion Pictures.